አቶ ማድያት በቅርቡ በገርል_ፍሬንዴ አፍንጫ እና ፊት ላይ የጥፋት ጦርነት በመክፈት"የሴት ልጅ ውበቷ ፊቷ" የሚለውን የቆየ የአያቶቻችን አባባል "የሴት ልጅ ውበቷ ዳሌ እና ባቷ" ወደሚለው ለመቀየር ያላሰለሰ ጥረት በማድረግ ላይ ይገኛል::እናም ይህንን ጥቃት ባጭሩ ለመቅጨት ከእኔ እና ከባለቤት በተጨማሪ የሳይበር ወታደሮችም ቢሳተፉ ጥሩ ውጤት ሊመጣ ይችላል የሚል ግምት ስላለን የሚከተሉትን ጥያቄዎች አቅርበናል::1) ምን አይነት ዘመናዊ መዳሃኒት ሊያጠፋው ይችላል? 2) ማድያት በእንግሊዘኛ ምን ይባላል? Melasma, also known as chloasma, appears as a blotchy, brownish pigmentation on the face that develops slowly and fades with time. The pigmentation is due to overproduction of melanin by the pigment cells, melanocytes. Pregnancy – the pigment often fades a few months after delivery. Melasma usually affects women; only one in twenty affected individuals are male. It generally starts between the age of 30 and 40. It is more common in people that tan well or have naturally dark skin compared with those who have fair skin.Melasma affects the forehead, cheeks and upper lips resulting in macules (freckle-like spots) and larger patches. Occasionally it spreads to involve the sides of the neck, and a similar condition may affect the shoulders and upper arms. Melasma is sometimes separated into epidermal (skin surface), dermal (deeper) and mixed types. Melasma can be very slow to respond to treatment, so patience is necessary. Start gently, especially if you have sensitive skin. Harsh treatments may result in an irritant contact dermatitis, and this can result in postinflammatory pigmentation. Generally a combination of the following measures is helpful. Year-round sun protection. Use a broad-spectrum very high protection factor sunscreenof reflectant type and apply it to the whole face. Alternatively, use a make-up containing sunscreen. Use of a mild cleanser, and if the skin is dry, a light moisturiser. This may not be suitable for those with acne. Hydroquinone2-4%, for 2 to 4 months. This sometimes causes stinging and redness. Azelaic acidcan be used longterm, and is safe even in pregnancy. It may sting. Sometimes a topical corticosteroidsuch as hydrocortisone is prescribed, which works quickly to fade the colour and has an additional benefit of reducing the likelihood of a contact dermatitis caused by other agents. Topical alpha hydroxyacidsincluding glycolic acid and lactic acid, as creams or as repeated superficial chemical peels. Topical retinoids, such as tretinoin. This works in several ways to improve skin colour, but can be hard to tolerate and might cause dermatiits. Do not use this during pregnancy. Dermabrasion and microdermabrasionshould be undertaken very cautiously; damage to the melanocytes may increase pigment production and darken the melasma. Laser resurfacing– results may be unpredictable. Newer fractional lasersmay prove safer. Destroying the pigment with pigment laser or intense pulsed lightdevice – this is possibly the best treatment for a quick result but several treatments may be necessary. Results take time and the above measures are rarely completely successful. About 30% of patients can achieve complete clearance with a prescription agent that contains a combination of hydroquinone, tretinoin and a topical corticosteroid. Gupta AK, Gover MD, Nouri K, Taylor S. The treatment of melasma: A review of clinical trials. J Am Acad Dermatol 2006;55:1048-65. Medline. 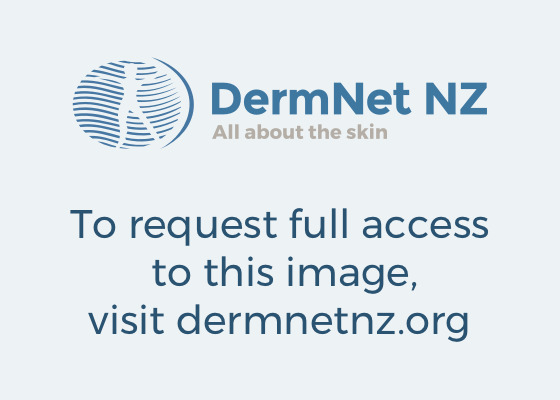 DermNet does not provide an on-line consultation service. If you have any concerns with your skin or its treatment, see a dermatologist for advice. "Courage is the hyphen between who we are today, and who we will become tomorrow." What is melasma? What are signs of melasma? Melasma is a very common patchy brown, tan, or blue-gray facial skin discoloration, almost entirely seen in women in the reproductive years. It typically appears on the upper cheeks, upper lip, forehead, and chin of women 20-50 years of age. Although possible, it is uncommon in males. It is thought to be primarily related to external sun exposure, external hormones like birth control pills, and internal hormonal changes as seen in pregnancy. Most people with melasma have a history of daily or intermittent sun exposure. Melasma is most common among pregnant women, especially those of Latin and Asian descents. People with olive or darker skin, like Hispanic, Asian, and Middle Eastern individuals, have higher incidences of melasma. An estimated 6 million women are living in the U.S. with melasma and 45-50 million women worldwide live with melasma; over 90% of all cases are women. Prevention is primarily aimed at facial sun protection and sun avoidance. Treatment requires regular sunscreen application and fading creams. The exact cause of melasma remains unknown. Experts believe that the dark patches in melasma could be triggered by several factors, including pregnancy, birth control pills, hormone replacement therapy (HRT and progesterone), family history of melasma, race, antiseizure medications, and other medications that make the skin more prone to pigmentation after exposure to ultraviolet (UV) light. Uncontrolled sunlight exposure is considered the leading cause of melasma, especially in individuals with a genetic predisposition to this condition. Clinical studies have shown that individuals typically develop melasma in the summer months, when the sun is most intense. In the winter, the hyperpigmentation in melasma tends to be less visible or lighter. When melasma occurs during pregnancy, it is also called chloasma, or "the mask of pregnancy." Pregnant women experience increased estrogen, progesterone, and melanocyte-stimulating hormone (MSH) levels during the second and third trimesters of pregnancy. However, it is thought that pregnancy-related melasma is caused by the presence of increased levels of progesterone and not due to estrogen and MSH. Studies have shown that postmenopausal women who receive progesterone hormone replacement therapy are more likely to develop melasma. Postmenopausal women receiving estrogen alone seem less likely to develop melasma. People with a genetic predisposition or known family history of melasma are at an increased risk of developing melasma. Important prevention methods for these individuals include sun avoidance and application of extra sunblock to avoid stimulating pigment production. These individuals may also consider discussing their concerns with their doctor and avoiding birth control pills and hormone replacement therapy (HRT) if possible. Melasma is characterized by discoloration or hyperpigmentation primarily on the face. Three types of common facial patterns have been identified in melasma, including centrofacial (center of the face), malar (cheekbones), and mandibular (jawbone). The centrofacial pattern is the most prevalent form of melasma and includes the forehead, cheeks, upper lip, nose, and chin. The malar pattern includes the upper cheeks. The mandibular pattern is specific to the jaw. Four types of pigmentation patterns are diagnosed in melasma: epidermal, dermal, mixed, and an unnamed type found in dark-complexioned individuals. The epidermal type is identified by the presence of excess melanin in the superficial layers of skin. Dermal melasma is distinguished by the presence of melanophages (cells that ingest melanin) through out the dermis. The mixed type includes both the epidermal and dermal type. In the fourth type, excess melanocytes are present in the skin of dark-skinned individuals. Melasma is usually readily diagnosed by the typical appearance of brown skin patches on the face. Dermatologists are physicians who specialize in skin disorders and often diagnose melasma by visually examining the skin. A black light or Wood's light (340-400 nm) can assist in diagnosing melasma. In most cases, mixed melasma is diagnosed, which means the discoloration is due to pigment in the dermis and epidermis. Rarely, a skin biopsy may be necessary to help exclude other causes of this local skin hyperpigmentation. The most common melasma therapies include 2% hydroquinone (HQ) creams like the over-the-counter products Esoterica and Porcelana and prescription 4% creams like Obagi Clear, Glyquin, Tri-Luma, and Solaquin. Products with HQ concentrations above 2% generally require a prescription. Clinical studies show that creams containing 2% HQ can be very effective in lightening the skin and less irritating than higher concentrations of HQ for melasma. These creams are usually applied to the brown patches twice a day. Sunscreen should be applied over the hydroquinone cream every morning. There are treatments for all types of melasma, but the epidermal type responds better to treatment than the others because the pigment is closer to the skin surface. Melasma may clear spontaneously without treatment. Other times, it may clear with sunscreen usage and sun avoidance. For some people, the discoloration with melasma may disappear following pregnancy or if birth control pills and hormone therapy are discontinued. In order to treat melasma, combination or specially formulated creams with hydroquinone, a phenolic hypopigmenting agent, azelaic acid, and retinoic acid (tretinoin), nonphenolic bleaching agents, and/or kojic acid may be prescribed. For severe cases of melasma, creams with a higher concentration of HQ or combining HQ with other ingredients such as tretinoin, corticosteroids, or glycolic acid may be effective in lightening the skin. Possible side effects of melasma treatments include temporary skin irritation. People who use HQ treatment in very high concentrations for prolonged periods (usually several months to years) are at risk of developing a side effect called ochronosis. Hydroquinone-induced ochronosis is a permanent skin discoloration that is thought to result from use of hydroquinone concentrations above 4%. Although ochronosis is fairly uncommon in the U.S., it is more common in areas like Africa where hydroquinone concentrations upward of 10%-20% may be used to treat skin discoloration like melasma. Regardless of the potential side effects, HQ remains the most widely used and successful fading cream for treating melasma worldwide. Regular medical follow-up appointments with a doctor are important for people using HQ treatment for melasma. HQ should be discontinued at the first signs of ochronosis. Thank you for this information. a lot of habesha people specially woman have this madiat problem.